Yesterday was supposed to be a very central day between the past and the future in our day-to-day lives. Grace’s Mitrofanoff surgery was the end goal, the prize if you will at the end of two years of working to prevent all to frequent urinary tract infections (UTI). In order to proceed with the surgery we had to prove that cathing would solve the problems. We have found that with regular cathing four times a day (now moving to five times daily) along with a nightly rinse of the bladder and an instillation of an antibiotic would prevent the UTIs. This was further mediated as we have been able to manage her bowel movements through another process that helps reduce the pressure on her bladder. We did everything we needed to do and it has come with limits on our daily life. With Graham if he has to go the bathroom while out and about you quickly find the nearest and hopefully moderately clean bathroom. With Grace we need a place to lay her down, a private place that is clean and would not present other infection complications. We time activities around her schedule and we have figured out how to squeeze every possible minute to the max to take care of her needs but also provide Grace with a life that does not require her being a prisoner in her own home. We had dreams of what life would be post-surgery, the hope of freedom and exploring the world, possibly traveling a distance further than the time in between two cathings. While only delayed a month it is a draining hit from what we were prepared for. Yesterday I went back to work traveling to Cedar Rapids for a meeting that I was originally going to miss. Joy stayed home with Grace and was confronted with the reality of Grace’s day to day cares. I pondered them while she dealt with them. As I drove I reflected that if the day had gone to plan I would be once again driving on I-35 a drive to “the Cities” a drive I have made countless times. While in college I went to “the Cities” frequently to visit friends, travel to fraternity events, or catch an occasional GB Leighton show. A roommate in college who shall remain nameless (Ben) essentially told me that normal people refer to Minneapolis and St. Paul as the Twin Cities, but not I…to me they are “the Cities.” Little did I know that all of my travels to the Cities and eventual one year stint as a Minnesotan would come in handy navigating to all the places we take Grace to for her medical needs. I never intended living in the Des Moines area; it wasn’t what I was looking for and I longed for life in a slightly more exciting place, a place with ready access to more, or just the ability to have adventure. It’s the wanderlust in me needing to be exercised. After waiting ten years we were on the cusp of having some freedom and it slipped away albeit for just an additional month. Don’t get me wrong being in Des Moines has presented us with some unique opportunities for Grace and we know that finding a better place to live would be an incredibly difficult task if not impossible. Recently I was able to exercise my wanderlust on an overnight trip to St. Louis to see Bruce Springsteen & the E-Street Band. I had full intentions of maximizing those two days away but they were cut short in part due to Grace receiving an adapted bike from the Variety Club who asked for us to be on air during their telethon and on the other side an IEP meeting. Both were good things but they came with some sacrifice of which I was happy to comply. I arrived in St. Louis, parked the car and made a beeline to the general admission lottery area to attempt to gain entry to the pit. There were only 10 minutes left, I got my ticket and waited in line and just a few minutes later my section won and were the first to enter the arena floor. Having driven for six hours I then stood for six hours and was imparted into a 35th anniversary of a cover to cover rendition of “The River”. The music spoke just as much today as it did when originally written, two times Bruce reflected on the album that I thought of during my time on the road yesterday. “…when you’re young and you’re first startled by your parents humanity and shocked to realize that they have their own desires and their own dreams and their own hopes that may or may not have panned out the way they thought they might. And all you can see when you are young are all the adult compromises that they had to make. And you’re still too young to see the blessings that come with compromise. So all you can see is a world closing in, closing in and all you can think about is getting out and getting away…” This is true even in the present day where I find myself struggling with the blessings of compromise. We learned today that the second urine culture that was collected prior to starting antibiotics came up negative after 48 hours and that the lab was concluding the test after just 48 hours. The test that showed the bacteria was cultured for six days. Talking with a former lab manager I’ve learned that a urine culture would be completed in 48 hours and would not be cultured for six days. So it appears a false positive may be responsible for the delays. In the meantime my hope is that within our compromise that we are doing something good. Many times it feels like the tank is empty and there should be energy for more, but in reality emptying the tank may have been the something good. Grace will be undergoing a surgery to have a Mitrofanoff that will create a tunnel using her appendix between the bladder and outside of her abdomen. This will allow for us to easily empty her bladder with a catheter making her personal cares easier as she continues to grow and will help prevent UTIs which she has been prone to over the years. This week was meticulously planned in prep for Grace to have the surgery tomorrow. Joy was traveling for work and we worked out the details of managing everything that needed to be done in prep. All systems were go. I was wrapping up my time at work yesterday and ready to be off for a week and a half when I got the call. The surgeon’s office called to tell us that bacteria showed up in Grace’s urine culture on the sixth day and we need to treat it ASAP along with getting another urine culture if there was any hope of still having the surgery. I raced home to meet Grace and her nurse, collected the sample and headed off to the lab. Dropped off the sample and stopped by two pharmacies on the way home to pick up prescriptions we would need for our time away and the antibiotic she needed to start. In between numerous text messages with Joy and Grace’s nurse along with phone calls with Joy, the surgical clinic and the pediatrician’s office we seemed to be back on track. Although peculiar questions were asked like has ‘Grace been to Wisconsin?’ and there appeared to be disbelief that she was content and her health status was normal. The bacteria found is named Elizabethkingia Anophelis a bacteria string recently discovered where 69 people in three states have confirmed cases, 26 that have been fatal. According to the Center of Disease Control (CDC) most of the patients were over 65, had serious health conditions and it is has not been determined if the bacteria or the other health conditions were the cause of the deaths. Grace would be the first documented case in Iowa and we joke that she now is the dot in Iowa on a CDC map. We have to laugh as Grace continues to teach us new things. This bacterium can be found in the earth and water worldwide and transmission is unknown. No need to worry there are no men in black suits outside or an ET bubble tent going up over our house. The bacteria could very well be living in many of us but without other health issues be inert and there is so little known about it that the infectious disease department at the hospital canceled the surgery as a precaution. We have started Grace on an antibiotic that is the preferred treatment option and will be following up with two additional urine cultures on top of the one currently in process. Surgery has been rescheduled, nursing schedules are being adjusted to cover the some of days we planned to be away, life has shifted and we have regained the next week and a half that we essentially carved out from all existence. In my mind time stopped today and would not resume until for another week and a half, everything would halt. The strangest thing that I had to do today was to go to daycare, still in disbelief myself and tell Graham that Grace was not going to have her surgery. Graham was painting and was not expecting me; he was expecting Grandma Choo Choo to pick him up and didn’t understand why I was there. I told him that I needed to talk to him and tell his 4-year-old brain that Grace was not going to have her surgery and we would not be going to the hospital. I felt like I was telling him someone died, perhaps because that was the mental state that I was in. He thought it would still be a good idea if he went to Grandma and Grandpas “for four days.” Turns out he really just wanted to convince Grandma to take him to ‘Old McDonalds’ on the way. Graham is always thinking, making lemonade out of lemons and he loves lemonade. So far we know that the preliminary culture is negative of the second sample prior to starting antibiotics. Now we wait. The rhythm plays every day. Some days we fight it and bemoan it. It feels constraining, limiting. We can’t do what we want because we have to keep it going. We stretch it in places to allow the flexibility we need to get something done, but sometimes there are consequences to that. One time, one horrible time, we’d flexed it so much that we actually forgot to feed Grace. Our girl, normally so easy-going was mad. M-A-D. When we realized we hadn’t fed her we felt absolutely horrible. On hard days the rhythm is what keeps you going, you know you have to do it and so you just move from one thing to the next, keeping her going and yourself. The rhythm happens if we are sick, if she is sick, if Graham is sick. If we are grieving, if we are exhausted, if things are changing, if we’re totally over-loaded, or having an easy day it continues. That’s the daily rhythm. There are others. She gets an infusion and a shot every 28 days. Fall and spring mean multiple trips to Minnesota for specialists that we are scheduled to see six months apart. Right now we are able to only have to see those docs twice a year and don’t have to schedule in the middle of winter. It usually means at least two trips to Minnesota and back each season. The docs only practice certain days. All in all to only be heading that way in two seasons is an awesome thing. 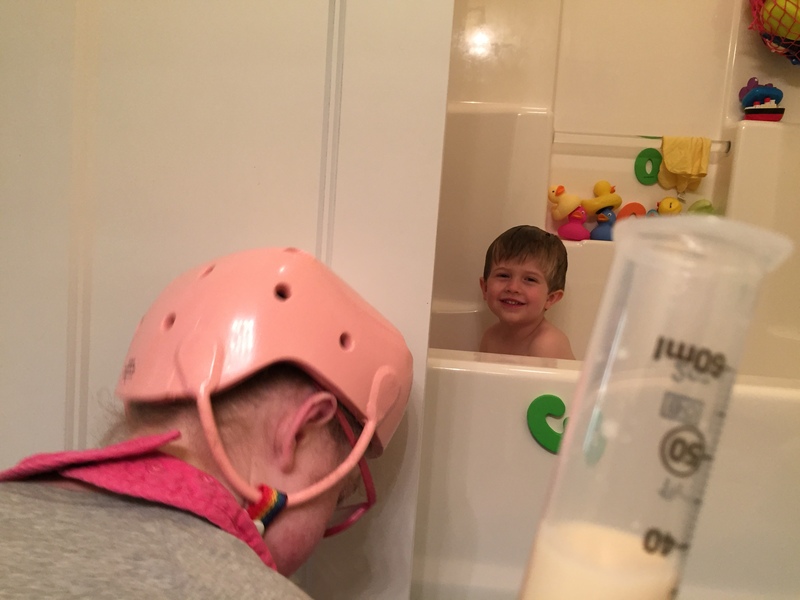 I have fed Grace in our bathroom while Graham is in the tub (I took a picture one night because it just seemed so strange yet normal to me in the moment) trying to keep the beat for both of them. I did this knowing ultimately someone would be off by the time it was all over, but trying my hardest to keep things on track. I was away from the rhythm for a few days recently. Coming back to it feels demanding, un-relenting even. I thought more about how we are just keeping her going in completing these activities. There’s no fun with her in there – except for the snuggle at bedtime. Now that I’ve been home a few days it feels less that way. It is what it is. It keeps her going so we can snuggle, and read, and swing, etc. We’ve been told that we make it all look easy. I’m never sure how to take that. Is it a compliment? Or is it a criticism that we aren’t as transparent about what it takes as we could be? I guess it doesn’t matter. It is what it is. It’s how we work. Part of the rhythm of our family.